When cleaning will not stop an odor, take it to the next level. 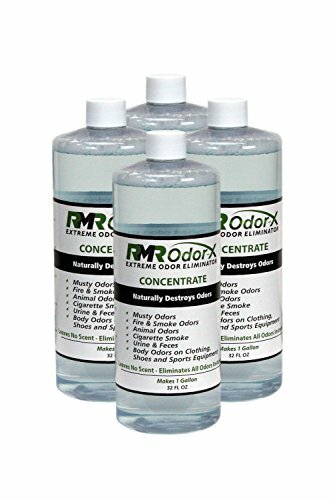 RMR Odor-X Extreme Odor Eliminator is a superior, colorless, natural odor-eliminating formulation that penetrates into porous substances such as wood, concrete, drywall, fiberglass, fabric, vinyl and more to encapsulate and kill the bacterial source of the odor. Just turn the sprayer nozzle to open and spray directly on any smooth or porous surface area. Use it in bathrooms, cabinets, storage areas, stables, kennels, barns, and cages, laboratories, laundries, locker rooms, gyms, kitchens and appliances, drains and sinks, basements, attics, garages, boats and marine areas, coolers, on outdoor canvas and vinyls, carpets and rugs, upholstery in the house, boat, car or RV, etc. Use it on walls, wood and HVAC systems to eliminate odors caused by pets, smoke, mold or mildew. Leaves no harmful residue. No rinsing or wiping required. RMR Odor-X does not lose its strength or effectiveness after application. It continues working and eliminating the odor at its source. Odor-X should be reapplied when a new odor is discovered. Odor-X is not diminished by weather conditions such as rain. Also available as a 32-ounce concentrate which will make one gallon. If you have any questions about this product by RMR Solutions, contact us by completing and submitting the form below. If you are looking for a specif part number, please include it with your message.